An Irish SIlver Shamrock Pendant with Marcasite Inlay - the Shamrock has been an iconic symbol of Ireland and is said to have been used by St Patrick to explain the Holy Trinity. This lovely pendant is made from Sterling Silver comes with an 18 inch silver chain, it is in a presentation box ready to give as a gift. 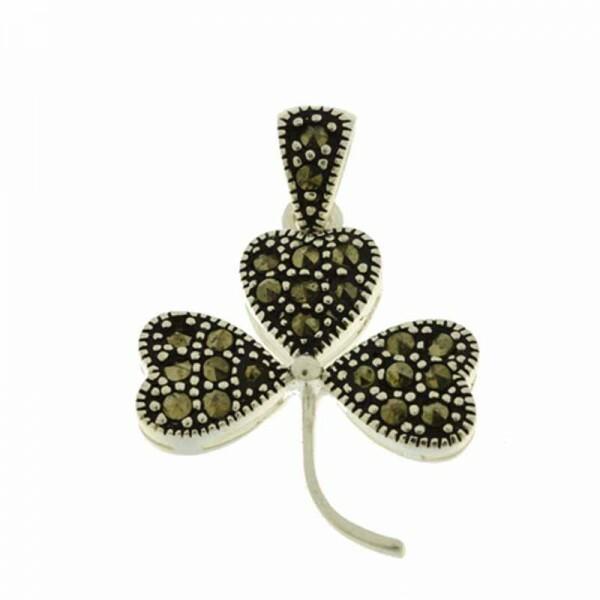 It is studded with Marcasite and has a discreet sparkle. The use of Marcasite goes back to the time of the Ancient Greeks and was very popular in Victorian times - class is timeless! A beautiful symbol of Ireland. Price includes Registered Airmail and tracking. The Irish SIlver Claddagh Ring has been associated with Galway since the late 1600's. The&nb..
A great Irish Silver Claddagh Ring made by one of our major designers and manufacturers. ..
Irish Coaster Set - Shamrock, Harp, Claddagh, Celtic Cross The iconic symbols of Ireland. St Patric..
A Silver Celtic Knot ring made in Ireland by Fado Jewellers. The symbol of intertwining knots was ve..